As interviews were being done by different media houses with those that had known or loved the life and music of the great Oliver Mtukudzi, one wondered which personality would bring the latest bit of juicy controversy for the masses to sink their teeth into. With so many microphones being shoved in the faces of many prominent personalities, who willingly took part in the spectacle, it was only a matter of time before one of them spoke out of turn and gave media its much needed headlines. Those in showbiz circles know that artistes do not do so well when they have to do more than sing into a microphone. Public relations are not their specialty, a fact that has resulted in the more astute managers shielding their charges from the “evil” of journalists’ questions. But things seemed different during the run up to Tuku’s funeral. Everything seemed perfectly rehearsed as artiste after artiste waxed lyrical about a legend whose passing left a nation in mourning. The run-up to Tuku’s funeral seemed guaranteed to be controversy free, with even Bev’s provocative dancing seen as more of light hearted amusement than a source of great controversy. Where would the thought provoking controversy come from? The answer would come in the form of a man who has never been keen to bite his tongue. Funeral or wedding, Thomas Mapfumo is one that will always speak his mind and true to form, he didn’t not let such an occasion pass without stirring the pot with his notoriously sharp tongue. 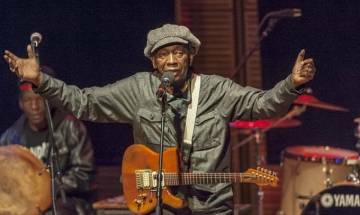 While the world’s eyes were turned on Zimbabwe as it prepared to bury one legend, Mapfumo took the opportunity to cast doubt about the greatness of another. His statement was delivered with typical Mapfumo swagger and arrogance, as he uttered what would otherwise be a joke with matter of fact assurance. Macheso is nothing, he seemed to sneer, and he will never belong to the exclusive club which only Tuku and him are the only members. For followers of Macheso and lovers of sungura in general, Mukanya’s rebuke would have been particularly stinging. After decades of undenied excellence, Mukanya and Tuku are two figures that have always loomed large on the country’s music scene. While his popularity might have even surpassed that of the two greats at the height of his powers, Macheso has always seemed to occupy a tier below these two giants. While he is an undisputed legend, to mention him in the same sentence as those two would be the regarded as close to blasphemy by their staunch music followers. With Tuku’s death perhaps, some might have begun to think that the only living legend that could comfortably rub shoulders with a still breathing Mukanya was the man who has remained on Zimbabweans’ tongues for two decades. With that utterance, Mukanya seemed to be denying Macheso entrance to an elite league that he believes only he and Mtukudzi should play in. After that interview, widely circulated on social media, the reactions from music lovers were varied. Some took it as an illustration of Mukanya’s arrogance, an arrogance that stood in sharp contrast to the humility of the man who the world had come to bury in Madziva. Others however, see nothing wrong with Mapfumo’s statement or character, as it reinforced the sentiment that Macheso was indeed not at the level of Tuku and Mukanya. What many did not ask in the emotion of the moment was whether Mukanya’s statements were true or not. Has Macheso done enough to be held in similarly high regards outside Zimbabwe as he is within the country? While his greatness in Zimbabwe has never been questioned, outside the country’s borders Macheso has never seemed to have quite as many fans. Some might say that perhaps this is due to the sungura genre itself than the man who has been its face for two decades. Tuku and Mukanya won international hearts by taming traditional instruments and musical styles into a dish whose flavour even international audiences could appreciate. Perhaps sungura, which traces its roots from the Democratic Republic of Congo, does not carry the same appeal. With that being said however, one has to acknowledge that the likes of Leonard Dembo had a measure of international recognition with songs like Chiteketeke, proving perhaps that Sungura could catch the ear of listeners beyond Zimbabwe’s borders. So where has Macheso gone wrong in his career and why is he largely unappreciated outside the country? In truth, perhaps it takes more than good music to crack the international music scene. As Jah Prayzah has shown over the last few years, a lot of resources are needed to crack the international market, with collaborations and partnerships a large part of what is required to make it. Mtukudzi broke into the international music scene after over two decades in the music industry and collaborations with the likes of Ringo Madlingozi played a large part of his late career transformation. Whether Macheso can bloom as late in his career as Tuku did, warrants further debate. Thus far, he has not shown the hunger of someone who craves foreign acknowledgment and some will wonder whether he still has the artistic hunger to shine beyond Zimbabwe. Mukanya’s rebukes tend to stick on those that they are aimed at and indeed the question of Macheso’s attractiveness to international audiences is likely to pop up again in future. While Mapfumo might take pride in his lofty reputation outside Zimbabwe, some artistes are happy and cosy in the warm and familiar embrace that they get at home. The success and respect that both men get at home proves that there’s nothing wrong with either of those two perspectives.